First and foremost, Happy New Year! Make 2015 a year to remember. I am. Like I shared in my last post “Looking Ahead to 2015,” I’m working on some major projects for this year. Certainly exciting times for me and I want to invite you along on the voyage! 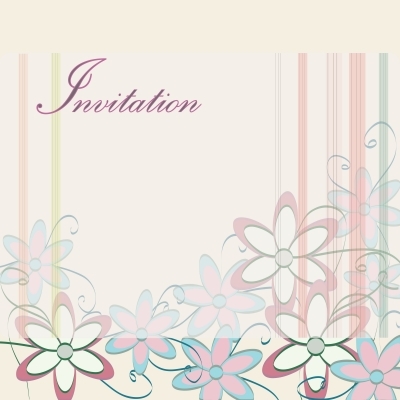 That invite begins with heading over to the brand new zacharyfenell.com and subscribing there. Moving forward I will blog from said domain. Meanwhile this site will become static, transitioning to a virtual archive. To stay updated on my writing and life endeavors, please subscribe to zacharyfenell.com (scroll down to the bottom left corner). Know your subscription means a lot to me. Without you my typed words only add litter to the already content polluted Internet. You give my blog meaning! Hopefully I will see your names as WordPress floods my inbox with new subscription notifications. Again I hope you subscribe to the new site (remember scroll to the bottom left corner). Subscribing will guarantee you first knowledge on my new book project plus so much more! I’m really excited about what the future holds and I want to share the excitement with you. In my post last weekend I mentioned turning my focus towards 2015 and then proceeded to share a very honest look back at 2014. With only three days now left before next year arrives I wanted to use my final 2014 post to reveal what you can expect from me come 2015. Below you will find three major projects I’m actively working on. My website’s home page before I begin a complete makeover. 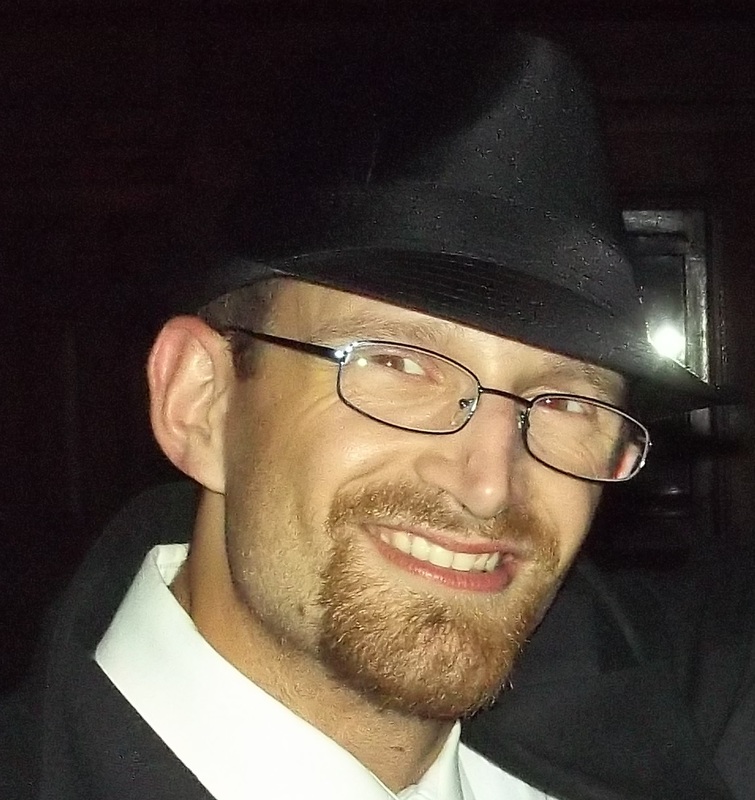 Over the last two weeks I conducted diligent research seeking a new web host for zacharyfenell.com (currently hosted and built through Homestead Technologies). 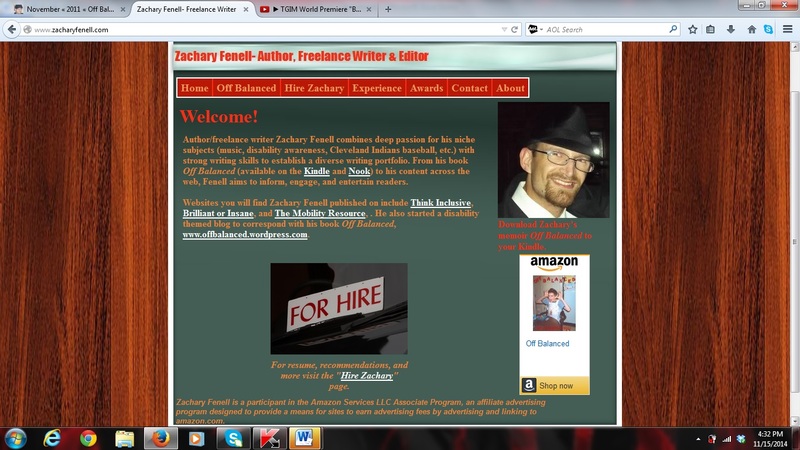 I’m planning a complete makeover, involving integrating this blog into zacharyfenell.com. By combining the two I’m aiming to establish a singular online hub for potential freelance clients and my readers alike to learn more about me. Following careful deliberation I’m all but officially decided to use DreamHost’s DreamPress. Before 2014 closes I hope I can remove “all but” from the previous sentence. Yes, I’m working on another book. Calm down though Off Balanced readers. The sequel to my teenage memoir some expressed interest in still proves far off. After all I’m currently living the experiences which will eventually become that sequel. However, my next book will stay in the non-fiction realm. Outside that I am unwilling to delve into details. I know I’m a tease. 🙂 Expect details within the next couple months. Finally, I’m working with Reaching for the Stars Student Ambassador Blake Henry to refresh and stir new excitement around the live weekly Twitter chat #CPChatNow (Wednesdays 8pm EST). 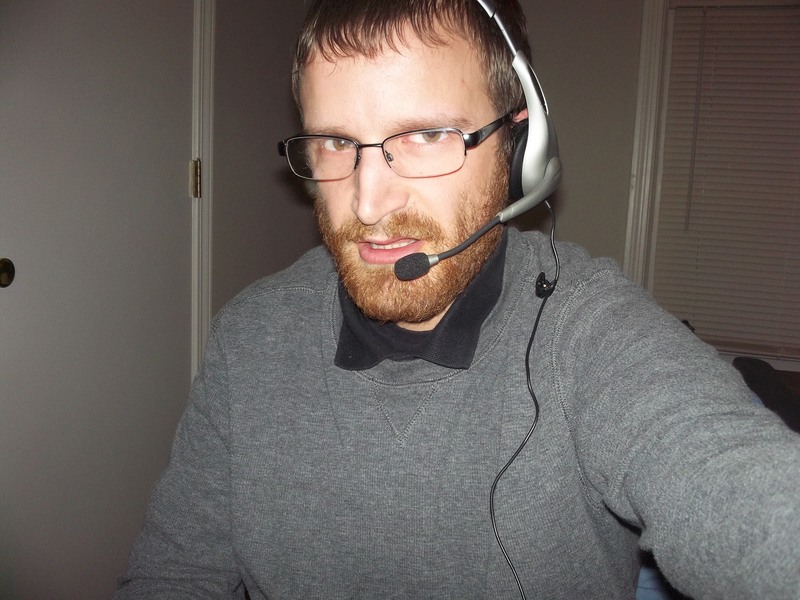 John W. Quinn, Handicap This’ Tim Wambach, and I started the chat in December 2013. Busy schedules caused both John and Tim to step back from #CPChatNow in 2014. #CPChatNow kept on but gradually started to lose participation and the early 2014 enthusiasm slowed too. Determined to re-energize #CPChatNow I asked Blake to step in as my new co-host. On Thursday, December 18th we held a Google Hangout with our fellow #CPChatNow kin. Blake and I gathered essential feedback from the Hangout which we will use to better #CPChatNow in the New Year. If you live with cerebral palsy or want to gain insight about CP from those with the condition, please join us. Start by liking the #CPChatNow Facebook Fan Page. Your turn! Comment and tell what you plan to accomplish in 2015. Happy New Year! This past week I turned my focus to 2015. Yes, I know 10 days remain in 2014. I’m using those final days to position me towards a successful 2015. Given so, I thought today marked an ideal time to look back on the past 355 days. Up until last month I viewed 2014 with a negative cogitation. Early heartbreak weighed heavily on me. In January my incredibly supportive aunt received a grim leukemia diagnosis, beginning a 10-month emotional rollercoaster ending with her passing away in October. Then on February 1st I lost a good friend to suicide, something which caught me completely by surprise. The aforementioned grief understandably halted my typical production rate with putting out content, whether to my blog, vlog, or to freelance clients. As time passed though, I found my production rate staying stifled. In my November video “Happy Thanksgiving from Author Zachary Fenell” I refer to dealing with “entrepreneur burnout,” admittedly self-diagnosed following deep reflection on my effort put forth into my freelance business. 2014 marked my fifth year since graduating Notre Dame College with my BA, alas also my fifth year freelancing. There exists a glaring gap between where I am after five years freelancing (still living with my parents and bringing in a weak income) and where I believe I should stand (fiscally independent with a viable business). Certainly mistakes made during my first few years freelancing helped lead me to my current situation. Lacking self-discipline and ineffective time management sure played a role too. Put bluntly, I’m failing as a freelancer. That reality overwhelmed me, causing my burnout. Thankfully I’m an optimist at heart! Last month I forced myself to counter each negative from 2014 with a positive from the year. Over the last six months I established and maintained a regular exercise regimen, leaving me feeling my best physically since I stopped receiving weekly physical therapy (a nine-year period). Finally taking my goal to walk a half marathon seriously aided my ambition to maintain my exercising routines. Actually I planned to walk my first 5k (a short-term goal within my long-term half marathon goal) in September 2014. Unfortunately minimal registration led to the race getting cancelled. A delay in receiving my refund and my tight budget prevented me from registering for another race before winter arrived. Now I’m eyeing spring 2015 for my first 5k. Plus despite my lackluster freelancing efforts I enjoyed professional wins throughout 2014. Handicap This Productions (HTP) promoted me from Guest Blog Coordinator to Online Relationship Manager. With Think Inclusive I received a pay increase. Podcasters inquired me about coming onto their shows. For instance, The Inclusive Class and Sarah Sweeney’s Differently Abled. Obviously for all my business mishaps, I too did some things right. Most importantly yet, I continue to better understand the person I am. Emotional investment in people proves more important to me than my financial bottom line. Financial standing bothers me merely because society necessities so. Flying out to Arizona and making final in-person memories with my aunt means more to me than a viable business. 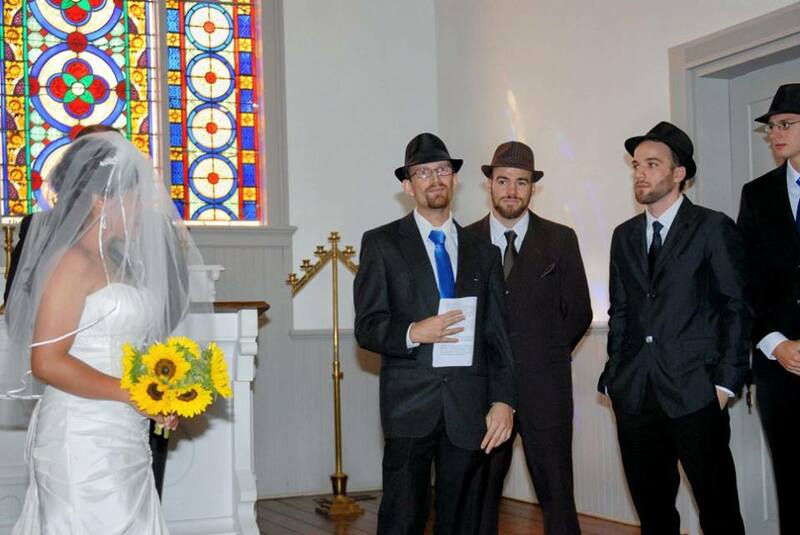 Witnessing my good buddy James (described in my memoir Off Balanced as the “real life Zack Morris”) get married to his “Kelly Kapowski” provided me value. Same with serving as best man for my best friend Mike Mannozzi back on October 10th when he wedded the wonderful Jemema. Their happiness brings me happiness. Instead I feel determined, and determination trumps all. Enough determination makes any task possible. 2014 I persevered through, surviving, growing tougher. That can only bode well for my 2015. What about you? Leave a comment sharing how you fared in 2014. Happy Holidays! December 13th represents my publishing anniversary. 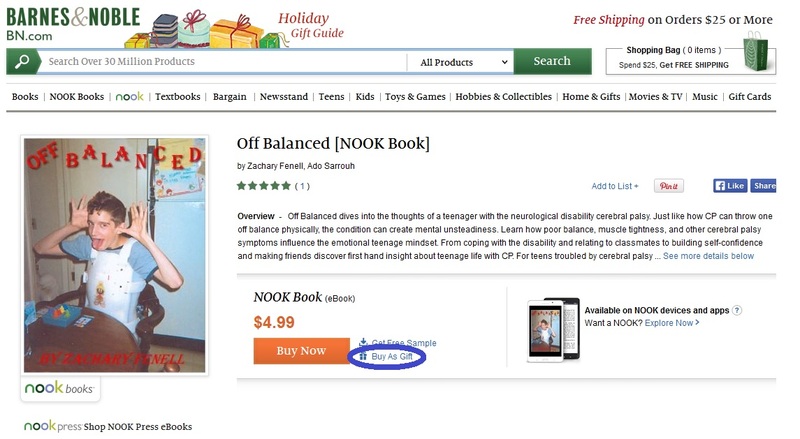 On December 13th, 2011 my memoir Off Balanced hit the e-book market (Kindle and Nook). Last year I commemorated the occasion by reflecting on the publishing process. This year I want to explore how becoming a published author changed my life, really in unforeseen ways. Thinking back these changes could only occur unforeseen. In 2011 I focused on staying the course with the publishing process. If you watched the embedded video above, you know that means marketing my book. Belief in Off Balanced’s ability to empower others with cerebral palsy and educate their parents, teachers, classmates, friends, etc. left me fully concentrated on promotion. No thought entered my mind about how becoming a published author could change my life. Another change manifested through learning new skills. Social media played and still does play a vital role in getting Off Balanced out there. Subsequently I ended up enhancing my social media skills, especially with Twitter and Youtube. Without my online book marketing experiences I never become qualified to hold a position like Online Relationship Manager for Handicap This Productions (HTP). Plus, who knows what my relationship with HTP or author/motivational speaker John W. Quinn looks like without Off Balanced. Going back to early 2011 I read about Handicap This and John, looking up to them awed by their stories. Upon my inquiries both Tim Wambach from HTP and John agreed to read Off Balanced and provide promotional blurbs. Those inquiries seem like pivotal moments leading to stronger connections with people I possess utmost respect for. Now the aforementioned offers a solid transitioning point to discuss personal change. Receiving respect back from those you look up to supplies a confidence boost. So does writing a book warmly received by readers. The average reader review for Off Balanced stands at 4.5 stars. Awesome for a five-star system! Possessing such confidence boosts helps to maintain confidence, not always an easy task since life hits hard. As star power and mushrooms aid Mario, my confidence boosts aid me to keep going during trying circumstances. To anyone out there contemplating writing a book, I recommend you pursue the ambitious endeavor. From my experience your hard work will pay off in rewarding ways. This past week the live cerebral palsy Twitter chat #CPChatNow reached the one year milestone! 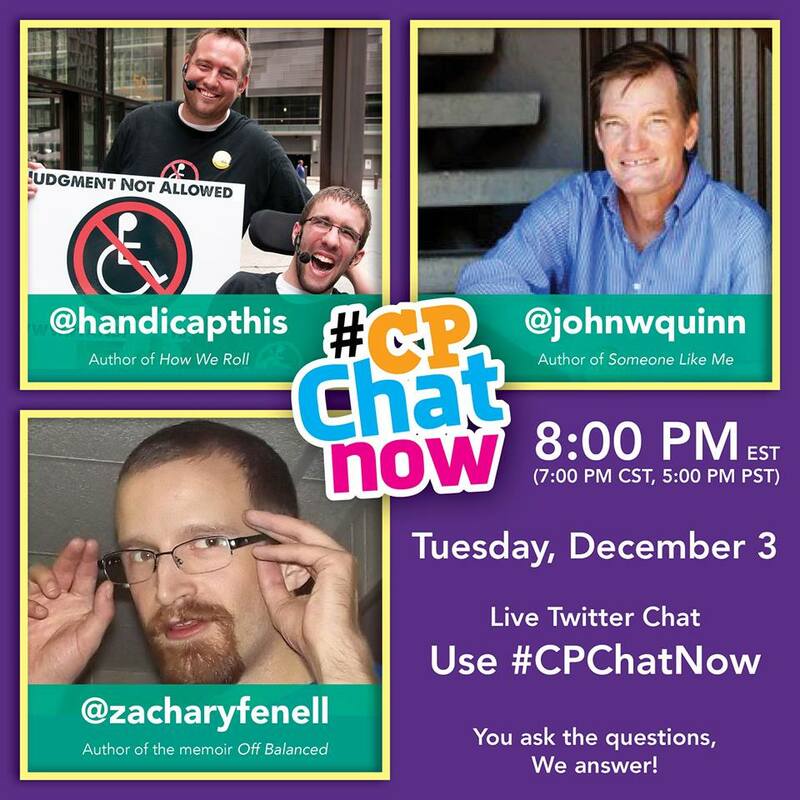 Yes, one year passed since John W. Quinn, Handicap This’ Tim Wambach, and I hosted the very first live #CPChatNow discussion Tuesday, December 3rd, 2013. As public figures in the cerebral palsy community we welcomed people with CP, their family members, caregivers, and whoever else to come ask us questions about CP. Demands for another live #CPChatNow chat rose leading #CPChatNow to quickly turn into a weekly deal. Each week new and familiar faces alike joined in. A few months later the demographic shifted to mostly people with CP evolving #CPChatNow into a support group. Every Wednesday at 8pm EST we took to Twitter to announce exciting news, vent our frustrations, and bond over experiences others with CP could best understand. The connections we made transcended Twitter and the Internet. Two young women with CP who actually attended the same elementary school (albeit grades apart) re-connected due to #CPChatNow. Through their travels Handicap This met different #CPChatNow regulars in-person. So far I personally enjoyed meeting in-person Blake, a young man with much potential. 2015 should see me getting the chance to meet more #CPChatNow kin in-person. No matter what 2015 brings though, the aforementioned demonstrates the real, meaningful connections made by the live chat. Now the year also saw other commitments leave my #CPChatNow co-hosts John and Tim to step back from the weekly chat. Upcoming events however should stir new excitement within the live chat’s community. Like the #CPChatNow Facebook page to stay informed. Join the conversation on Twitter every Wednesday starting at 8pm EST. Do so with these three easy steps listed in the following graphic. 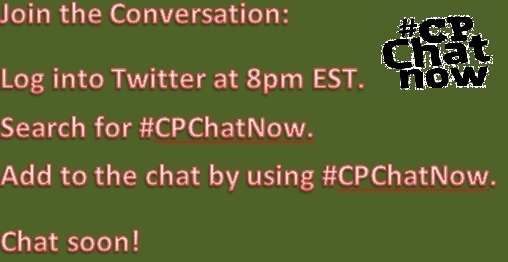 #CPChatNow takes place every Wednesday at 8pm EST. FYI we do still welcome participation from everyone. In other words cerebral palsy parents, caregivers, and curious strangers. Come join us! You might just find our feedback helpful. If you find yourself gift shopping for an avid reader, consider gifting e-books. Both Kindle and Nook books feature a gifting option. As you will see from the directions below, the process proves rather simple. 1. Go to the sales page for the Kindle book you wish to gift. 2. Click the “Give as a Gift” button, located on the right-hand side beneath the “Buy now with 1-click” button. 3. A form will load asking for the recipient’s e-mail address and date you wish to have your gift delivered on. Personalize the gift by including a short message 300 characters or less. You can adjust your payment option on the screen’s right-hand side. After you finish click “Place your order” at the bottom of the page. 1. Just like the Kindle instructions, go to the sales page for the book you wish to gift. 2. Click “Buy As Gift,” located next to the “Buy Now” button. 3. Fill out the form which includes the recipient’s e-mail address, re-typing the e-mail address for confirmation, your name, the recipient’s name, and a personalized message (maximum 250 characters). Click “Submit” once completed. But… what if I don’t know the person’s e-mail address? Go to the person’s Facebook page. Click “About,” located under the cover image. Scan his or her “About” page for an e-mail address. Or, create a rouse so you can ask the person for his or her e-mail without giving away the real reason behind the question. For example, say you want to forward the person an e-mail you think he or she will find interesting. On a final note, maybe you will want to gift my memoir Off Balanced to someone. 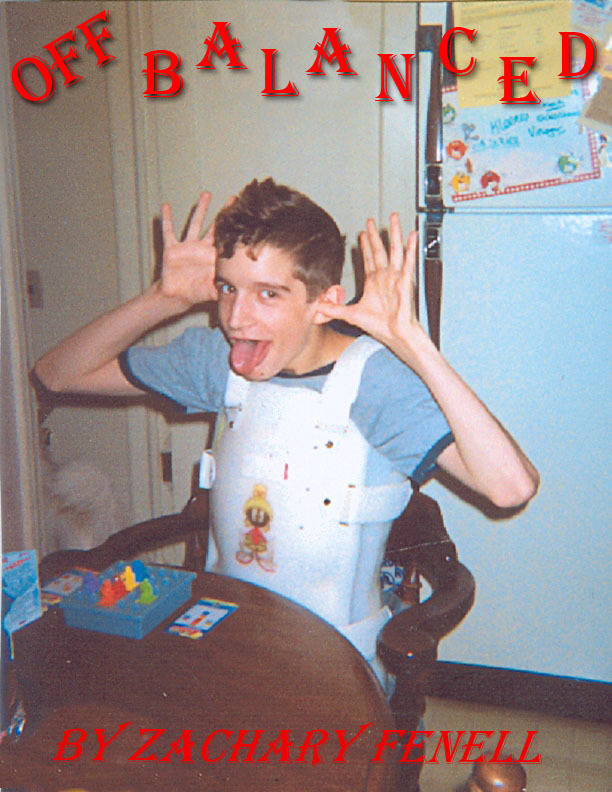 Off Balanced explores how my mild cerebral palsy affected me socially through adolescence. Checkout the following excerpts to determine if Off Balanced may interest someone on your holiday shopping list. Read a selection from chapter six “Not Enough” (courtesy Rebelle Society). 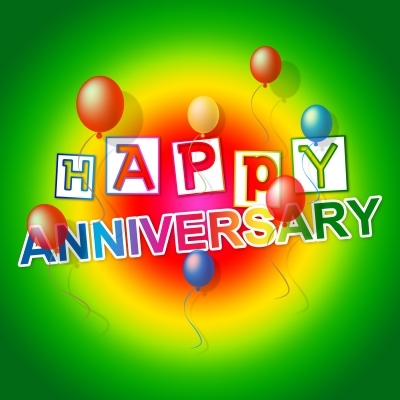 This past week marked the Off Balanced blog’s three-year anniversary. That seems crazy to me. So much from 2011 feels like yesterday. Yet here you and I sit. Well, I’m sitting. Maybe you will read this standing up or lying down. I can’t know that. Enough dickering over such detail though! Allow me to get back on-topic. Three years ago I stated the following as my blogging goal. Admittedly I lost my focus some. Last year I used my blog here to keep myself publicly accountable for my 2013 New Year resolutions. Good stuff I believe but at the same time mostly irrelevant to cerebral palsy. My admission brings about questions regarding Off Balanced the blog’s future. Should I re-focus on my blog’s initial goal? Or, do I move forth carrying a more open-ended attitude with subject matter? The latter may lead to moving my blog to www.zacharyfenell.com, which I’m planning a complete makeover for anyways. Reader feedback will help me make a more confident decision. Give your input by commenting below, letting me know what you prefer to see from me. Thanks in advance for your thoughts!